It is a best-established fact that, in long term, equity investment performs well than debt investment. You may not doubt the above phrase, but investment in equities requires discipline and long-term approach and appetite to absorb the short-term volatility. If you are thinking of good long term returns along with tax savings, then Equity linked saving scheme (ELSS mutual fund) is the best option for you. 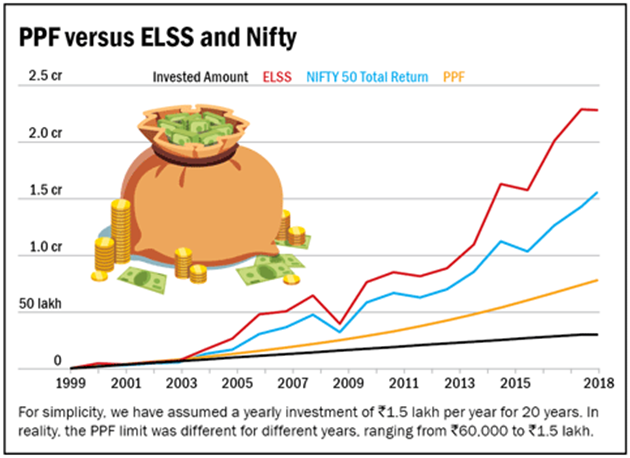 If we compare ELSS mutual funds with any other debt investment Like PPF in the long term, ELSS remain the best. But, as mentioned above, equities by nature have a volatile return in short term, so it is a must for the investors that they invest in equities with long term horizon only. As ELSS mutual funds have three years lock-in period, short term volatility will be automatically taken care of. In most of the cases, after 3-year time, you will have handsome returns. However, in our view, you should not withdraw the amount from ELSS even after completion of three years lock-in period to reap the full benefits. Main features of PPF as an investment option is that, you can invest maximum Rs 150000/- per annum in your name, spouse's name or the name of your children. A PPF account can be opened in authorised bank branches and post offices. The interest rate on PPF is declared on a quarterly basis by Govt of India. The interest is tax-free. The lock-in period is 15 years. However, you may withdraw the eligible amount after completion of 6 years also. You also have an option of premature closure of the account with a little penalty of interest. However, there are no penalties in case of medical emergencies. 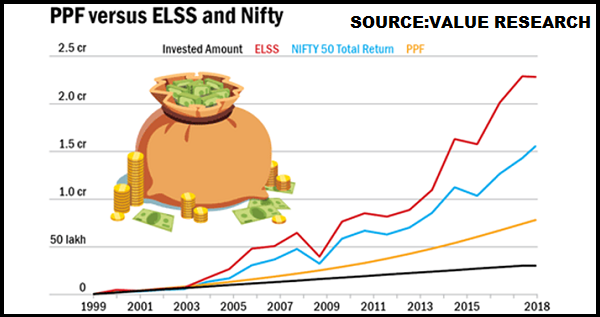 ELSS and PPF in long term is shown below. If we calculate return on investment of Rs 1,50,000 per year for 20 years from 1999 to 2018 in PPF, index fund of Nifty and ELSS funds, then as shown in the chart above, ELSS gives the best return and beats all other investment by a significant margin. In 20 years on investment of 30 lakhs (1.50 lakh per year for 20 years), PPF has given a return of 77.80 lakh, Index has given a return of 1.5, and Avg of ELSS funds has given a return of 2.3 crores, which is almost three times from the PPF returns. On the other side, PPF has given a risk-free return at a decent rate over the years. So, in our view, one should maintain a balance between debt and equity keeping in view the financial goals of life. It might not be a bad idea to come out of the comfort zone and explore the ELSS route.